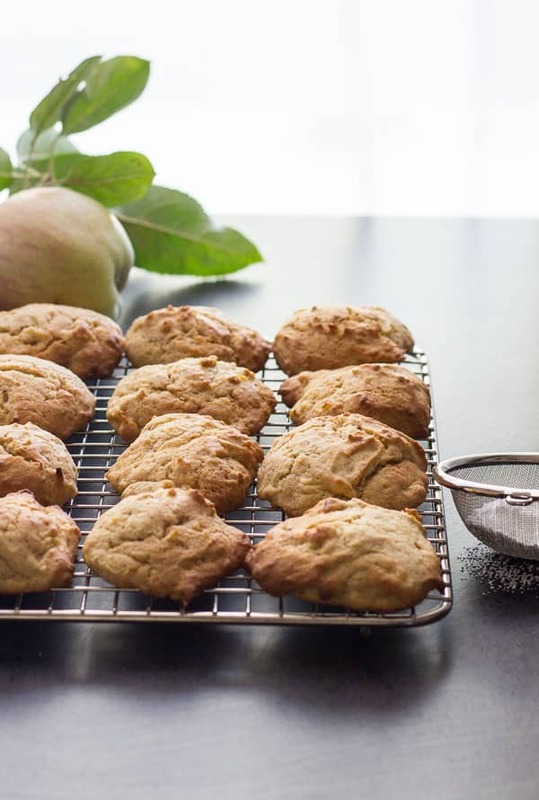 Cinnamon Applesauce Cookies, a healthier cookie, the perfect snack or dessert. 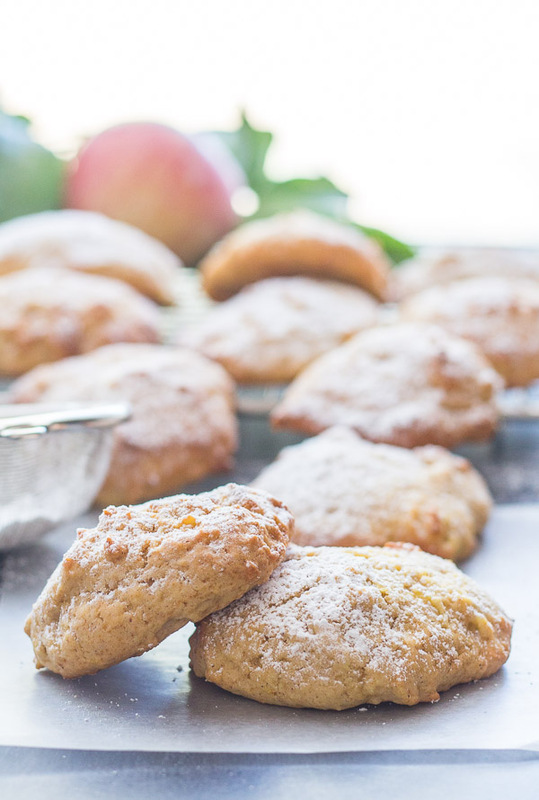 A delicious homemade applesauce makes these cookies even yummier! Everyone will love these including kids. 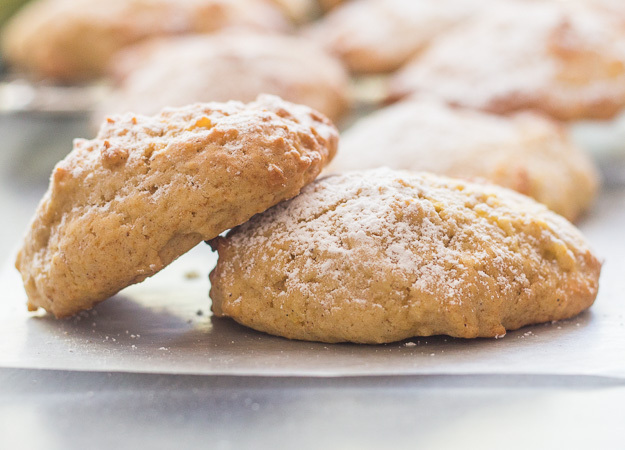 I haven’t posted a recipe for cookies in a while, but when I found Cinnamon Applesauce Cookies in my mother’s recipe cards, I knew I had to try them. Sweetened with less sugar and more applesauce I guess you could call them a healthier cookie. Since I can’t get applesauce in Italy I made my own. So simple and easy, very similar to my Apple Pie Filling. 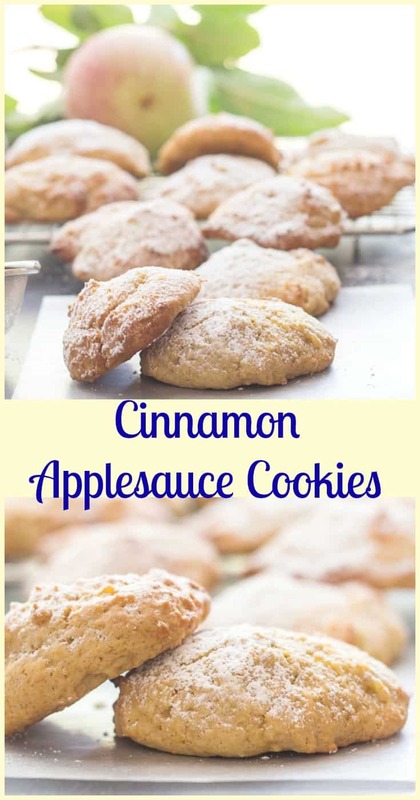 I added very little water because I needed a thick applesauce for these Cinnamon Apple Sauce Cookies. Canned works just fine, but what the heck it really doesn’t take long to make it homemade. And it is so good and probably a lot healthier than canned. 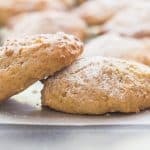 I have made these Cinnamon Applesauce Cookies a few times, and a couple of times I made the dough with my food processor. 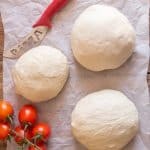 Mix it all together, no need to refrigerate the dough, make it and bake it. They come out soft, moist and almost cake like and you can dust them with a little powdered sugar if you like or eat plain. I noticed my Mom had written that they were better if you to let them rest for a day before eating, so that the cinnamon and apple would mingle really well together. Can’t say they lasted that long in my house. I have never seen cookies go so fast. (actually the Thick Peanut Butter Chocolate Chip Cookies came really close). A friend of ours came over for coffee in the morning, ate a couple of cookies and then came back in the afternoon for another coffee and another couple of cookies. He said they were that good. Enjoy! ** To make 1 cup cake flour, measure out 1 cup all-purpose flour, remove 2 tablespoons and add 2 tablespoons cornstarch (whisk together to combine). This recipe makes approximately 15-20 cookies. Pre-heat oven to 400° (200° celsius), line 2 cookie sheets with parchment paper. 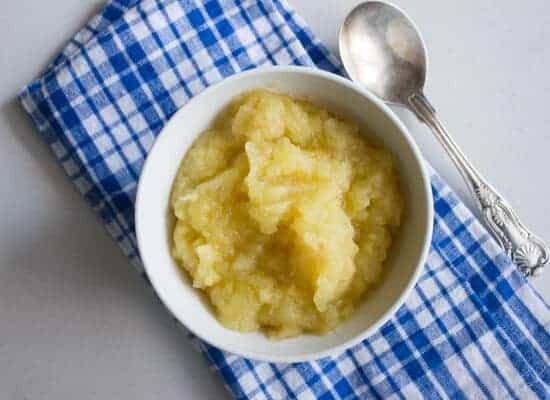 In a medium pot add chopped apples, water and lemon juice, cover and cook on low for approximately 15-20 minutes or until apples are soft, add 1 tablespoon sugar mash with a potato masher and continue cooking on low for approximately 5 minutes or until thickened. Let cool. Refrigerate unused applesauce, use within a week. In a medium bowl cream together butter and brown sugar add egg blend about 2 minutes, add sifted dry ingredients alternately with the applesauce, combine until just combined. Drop batter by spoonfuls (about the size of a golf ball) on prepared cookie sheets, bake for approximately 10-12 minutes until lightly golden. Keep in cool dry place, best if let to sit for 1 day before eating. (If you can wait) Enjoy! Dust with powdered sugar if desired. Republished from Feb 5, 2016. Hi Rosemary what a great tasting cookie. I make my own applesauce so when I saw this recipe I just had to make them. They are easy to make and delicious. Hi Mil, thanks so glad you like them and with homemade applesauce even better. Have a wonderful weekend. These cookies appeal to me very much. Your instructions call for a thick applesauce, and my applesauce is quite thin. How can I adjust the recipe to compensate for this? Hi Mara, you will have to add more cake flour, but add a tablespoon at a time until you reach the proper dough consistency (check the video for that). Depending on the amount of flour (any more than 1/2 cup) you may add a little more cinnamon and a tblsp of brown sugar. But I think the rest should be ok. Hope that helps. Let me know how it goes. What a delicious cookie! I used 1/4 cup pumpkin purée in place of the egg, due to my son’s egg allergy. They were a hit for the whole family. Thanks for sharing this delightful recipe. 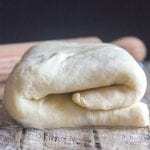 HI, I stumbled upon this recipe through yummily. The recipe sounds simple and delicious and want to try making them. Would like to know if All purpose flour will work cause I dont have cake flour at hand nor corn starch. Thank you. Hi Suhasini, all purpose flour will work just fine. Hope you enjoy them. Have a great weekend. Just made these and they turned out great. I have tons of frozen apple sauce from last year and need to make room in my deep freeze as I have a gazillion tomatoes to do again. Question: Have you ever added things like: raisins, cranberries, choc. chips, etc. 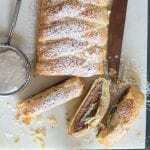 to this recipe? What amounts would you add? Hi Kat, thanks, glad you enjoyed them. I have never added anything to them but I would probably not add more than 1/4 cup of the ingredients. I bet raisins or cranberries would be delicious though. Let me know how they turn out. Have a great weekend. Hi Heather thanks hope you enjoy it, I agree apple and cinnamon is a great combination. These cookies are so pretty!!! what a great idea! 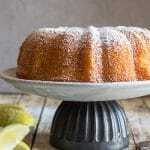 I sometimes add applesauce to my cakes! love your homemade version! These are so unique and wonderful! Yum! These cookies sound amazing. I don’t think I’d let them stick around in my house for day either! Hi Nicole, they were gone in a day. I would soo lose control around these cookies! I will definitely be making these cookies for my grandchildren. You cannot go wrong with cinnamon. Thanks for another great recipe. I love when you stumble upon on old family recipe. These cookies look fabulous! Hi Kristen, I know isn’t it the best. Thanks. Have a great day. We always have applesauce… So I think I’m going to have to make these! I just found you on Pinterest and am glad I did! I just spent way too long reading through your recipes. These applesauce cookies will definitely be gone before the apples and cinnamon get a chance to mingle at my house. Hi Maureen, thanks a lot, you made my day, hope you enjoy them. Have a great weekend.! They look delicious Rosemary!! And you’re right, applesauce is so easy to make. I remember my days of canning and how many jars of green beans, applesauce, peaches, tomatoes, salsa etc. At the time I thought it was a lot of work but now I really miss it. I used to love making sweets but since it is just hubby and I at home I don’t indulge. If we are visiting our kids and grandkids that’s when I go wild. I’m pinning your recipe. Buon fine settimana.